Unless you’ve been hiding under a rock, you know 2008 is an election year in the US. Will it be Hillary? Obama? Romney? Huckabee? When it comes to the stock market, it may not matter. Just the fact that this is an election year should put a smile on your face. So far this year, we’ve stumbled out of the gate. OK, more like tripped on our laces and landed square on our collective noses. But according to the election year seasonality, that’s in line with other years. In fact, we could be in for more pain all the way to the summer. But as we get closer to November 4th, 2008, the market should pick up steam. Or rather, more accurately put, it has performed better in the past. So even though we can’t count on the boost of the four year cycle this year, we have this to look forward to. It almost makes it worthwhile to sit through all those political TV ads, doesn’t it? You folks probably already know this, but Investors Intelligence readings this week were 45.6% bullish, 26.7% bears. Way too many bulls, too few bears. This is in contrast to the AAII sentiment which showed 24.3% bulls, 54.4% bears. Any comments on which might be right and why they are so different ? 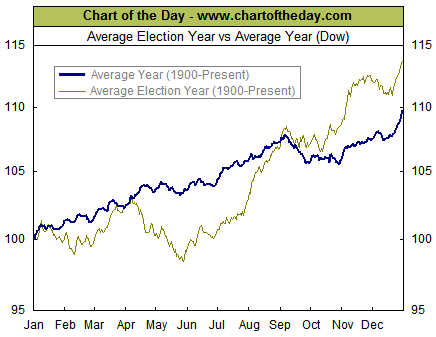 Lets see if markets during the 2008 election year does better than 2004, or dare I say it, 2000!